Dressed Up. Buttoned Down. 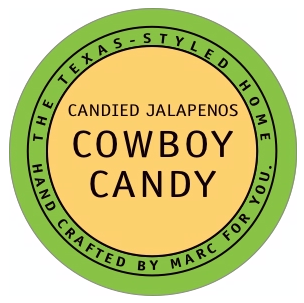 : Eat This: Gingered Sweet Pickled Jalapenos aka "Cowboy Candy"
Eat This: Gingered Sweet Pickled Jalapenos aka "Cowboy Candy"
I made candied jalapenos aka "Cowboy Candy" here in the past. Click HERE for the original recipe with step-by-step instructions. I ate or gave away my stock so it was time to make more. I wanted to change it up a little and this time, adding a layer of flavor so I added fresh ginger to the recipe. I love the Asian ginger influence mixed with the Texas taste of the jalapenos. I cooked fresh ginger, about a 3" long piece, peeled and chopped, in with the vinegar, sugar and spice mixture. I strained it all before adding the jalapeños. I also sliced ginger into rounds and simmered them in the syrup. These were added individually to the jars as I filled them as a visual treat and reminder that the jars contained a different taste. A couple of tips.. wear gloves - trust me on this one, WEAR GLOVES ... and try using a mandoline for slicing pounds of peppers ... it makes that big bowl fill up a lot faster!